This process, where a dying star gives rise to a massive cloud of dust, was already known to be incredibly beautiful and inspiring thanks to many images taken by Hubble. However, after viewing the famous Ant Nebula with the European Space Agency’s (ESA) Herschel Space Observatory, a team of astronomers discovered an unusual laser emission that suggests that there is a double star system at the center of the nebula. The study, titled “Herschel Planetary Nebula Survey (HerPlaNS): hydrogen recombination laser lines in Mz 3“, recently appeared in the Monthly Notices of the Royal Astronomical Society. 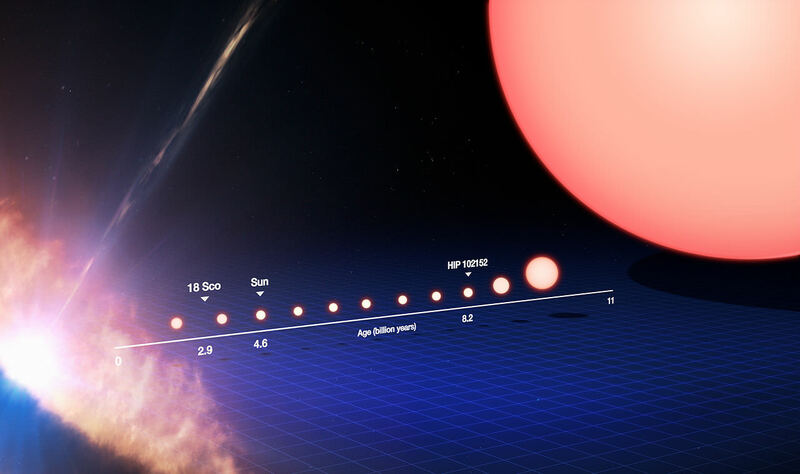 The study was led by Isabel Aleman of the University of São Paulo and the Leiden Observatory, and included members from the Herschel Science Center, the Smithsonian Astrophysical Observatory, the Institute of Astronomy and Astrophysics, the Royal Observatory of Belgium and multiple universities. The Ant Nebula (aka. Mz 3) is a young bipolar planetary nebula located in the constellation Norma, and takes its name from the twin lobes of gas and dust that resemble the head and body of an ant. In the past, this nebula’s beautiful and intricate nature was imaged by the NASA/ESA Hubble Space Telescope. The new data obtained by Herschel also indicates that the Ant Nebula beams intense laser emissions from its core. In space, infrared laser emissions are detected at very different wavelengths and only under certain conditions, and only a few of these space lasers are known. Interestingly enough, it was astronomer Donald Menzel – who first observed and classified the Ant Nebula in 1920 (hence why it is officially known as Menzel 3 after him) – who was one of the first to suggest that lasers could occur in nebula. According to Menzel, under certain conditions natural “light amplification by the stimulated emissions of radiation” (aka. where we get the term laser from) would occur in space. This was long before the discovery of lasers in laboratories, an occasion that is celebrated annually on May 16th, known as UNESCO’s International Day of Light. As such, it was highly appropriate that this paper was also published on May 16th, celebrating the development of the laser and its discoverer, Theodore Maiman. “Such emission has only been identified in a handful of objects before and it is a happy coincidence that we detected the kind of emission that Menzel suggested, in one of the planetary nebulae that he discovered,” she added. The kind of laser emission they observed needs very dense gas close to the star. By comparing observations from the Herschel observatory to models of planetary nebula, the team found that the density of the gas emitting the lasers was about ten thousand times denser than the gas seen in typical planetary nebulae, and in the lobes of the Ant Nebula itself. Next-generation space telescopes that could tell us more about planetary nebula and the life-cycles of stars include the James Webb Space Telescope (JWST). Once this telescope takes to space in 2020, it will use its advanced infrared capabilities to see objects that are otherwise obscured by gas and dust. These studies could reveal much about the interior structures of nebulae, and perhaps shed light on why they periodically shoot out “space lasers”. Do We Really Need Rockets to Go to Space? We’re familiar with rockets, those controlled explosions that carry cargo and fragile humans to space. But are there some non-rocket ways we could get to space? Want to go space? Get a rocket. Nothing else ever invented can release the tremendous amounts of energy in a controlled way to get you to orbit. It all comes down to velocity. Right now, you’re standing still on the Earth. If you jump up, you’ll come right back down where you started. But if you had a sideways velocity of 10 meters/second and you jumped up, you’d land downrange a few meters… painfully. And if you were moving 7,800 meters per second sideways – and you were a few hundred kilometers up – you’d just orbit the Earth. Gaining that kind of velocity takes rockets. These magical science thundertubes are incredibly expensive, inefficient and single-use. Imagine if you had to buy a new car for each commute. Just blasting a single kilogram to orbit typically costs about $10,000. When you buy a trip to space, only a few hundred k goes to the gas. Those millions of dollars mostly go into the cost of the rocket that you’re going to kick to the curb once you’re done with it. SpaceX is one of the most innovative rocket companies out there. They’re figuring ways to reuse as much of the rocket as they can, slashing those pesky launch costs, which ruin what should otherwise be a routine trip to the Moon. Maybe in the future, rockets could be used hundreds or even thousands of times, like your car, or commercial airliners. Is that the best we could do? Can’t we just ditch the rockets altogether? To get from the ground to orbit, you need to gain 7,800 meters per second of velocity. A rocket gives you that velocity through constant acceleration, but could you deliver that kind of velocity in a single kick? How about a huge gun and just shoot things into orbit? You need to instantly impart enormous velocity to the vehicle. This creates thousands of times the force of gravity on the passengers. Anyone on board gets turned into a fine red coating distributed evenly throughout the cabin interior. You can only get away with this a few times before your guinea pig passengers get wise. If you extend the length of the barrel of the gun over many kilometers, you can smooth out the force of acceleration that humans can actually withstand. This is the idea Startram proposed. They’re looking to build a track up the side of a mountain, and use electromagnetism to push a sled up to orbital velocity. This might sound far fetched, but many countries are using with maglev technology with trains and breaking speed records around the world. The Japanese recently pushed a maglev train to 603 kilometers per hour. This first version of Startram would cost $20 billion, and the tremendous forces would only work for any cargo being delivered in a non-living state, despite how it started out. Even more expensive is the version with a 1500-kilometer track, able to spread the acceleration over a longer period and allow humans to fly into space, arriving safely in their original “non-paste” configuration. There are a couple teeny technical hurdles. Such as a track 20 kilometers in altitude where projectiles exit the muzzle and venting atmosphere to prevent the shockwave that would tear the whole structure apart. If it can be made to work, we could decrease launch costs down to $50/kilogram. Meaning a trip to the International Space Station could cost $5,000. Another idea would be, unsurprisingly, lasers. I know it sounds like I’m making this up. Lasers can fix every future problem. They could track and blast launch vehicles with a special coating that vaporizes into gas when it’s heated. This would generate thrust like a rocket, but the vehicle would have to carry a fraction of the mass of traditional fuel. You don’t even need to hit the rocket itself to create thrust. A laser could superheat air right behind the launch vehicle to create a tiny shockwave and generate thrust. This technology has been demonstrated with the Lightcraft prototype. Artist’s conception of World View’s planned balloon mission some 19 miles (30 kilometers) up. Credit: World View Enterprises Inc.
What about balloons? It’s possible to launch balloons now that could get to such a high altitude that they’re above 90% of the Earth’s atmosphere. This significantly reduces the amount of atmospheric drag that rockets would need to complete the journey to space. The space colonization pioneer Gerard K. O’Neill envisioned a balloon-based spaceport floating at the edge of space. Astronauts would depart from the spaceport, and require less thrust to reach orbit. We’ve also talked about the idea of a space elevator. Stretching a cable from the Earth up to geostationary orbit, and carry payloads up that way. There are enormous hurdles to developing technology like that. There might not even be materials strong enough in the Universe to support the forces. But a complete space elevator might not be necessary. It could be possible to use tethers rotating at the edge of space, which transfer momentum to spacecraft, raising them step by step to a higher velocity and eventually into orbit. These tethers lose velocity with each assist, but they could have some other propulsion system, like an ion drive, to restore their orbital velocity. Future methods of accessing space will be a combination of some or all of these ideas together with traditional and reusable rockets. Balloons and air launch systems to decrease the rocket’s drag, electromagnetic acceleration to reduce the amount of fuel needed, and ground-based lasers to provide power and additional thrust and pew-pew noises. Perhaps with a series of tethers carrying payloads into higher and higher orbits. It’s nice to know that engineers are working on new and better ways to access space. Rockets have made space exploration possible, but there are a range of technologies we can use to bring down the launch costs and open up whole new vistas of space exploration and colonization. I can’t wait to see what happens next. What alternative methods of getting to space are you most excited about? Let us know your thoughts in the comments below. Since the beginning of the space age, radio waves have been used for communication with spacecraft. But last month, NASA’s Lunar Laser Communication Demonstration (LLCD) made history by using a pulsed laser beam to transmit data over the 385,000 km (239,000 miles) between the Moon and Earth at a record-breaking download rate of 622 megabits per second (Mbps). This was NASA’s first system for two-way communication using a laser instead of radio waves. In our previous article today, we described how NASA will test out the Optical PAyload for Lasercomm Science (OPALS) on the International Space Station to demonstrate how videos can be beamed to Earth via laser beam. What are the challenges in testing out an entirely new way of doing communications and other systems like navigation using lasers in space? Using lasers will allow for increased bandwidth for image resolution and 3-D video transmission from deep space, as well as allowing for tele-operation for long distances, such as from the Earth to the Moon. Meanwhile, NASA has three other laser technology demonstration missions in the offing, likely launching in 2015 and 2016. One is a solar sail demonstration will enable propellantless laser in-space navigation for missions such as advanced geostorm warning, economic orbital debris removal, and deep space exploration. Videos will beam to Earth on a laser beam in a technology demonstration coming to the International Space Station soon, says NASA’s Jet Propulsion Laboratory. The Optical PAyload for Lasercomm Science (OPALS) plans to move videos from space to an Optical Communications Telescope Laboratory in Wrightwood, Calif. Each demonstration test will last about 100 seconds, while the station and the ground receiver can “see” each other. While the experiment sounds awesome for sending back “home videos” from space, NASA is more touting it as a boon for transferring loads of scientific data back to Earth. “The scientific instruments in near-Earth and deep-space missions increasingly require higher communication rates to transmit their gathered data back to Earth or to support high-data-rate applications (e.g., high-definition video streams),” stated the OPALS webpage at NASA’s Jet Propulsion Laboratory. The experiment page (last updated in May) says it is intended to work for about a year, with the current Expedition 37/38 and forthcoming 39/40 crews. That said, it appears the payload is not aboard station yet. A July update from NASA said the SpaceX Dragon spacecraft is supposed to ferry OPALS to space. There hasn’t been a Dragon flight since that time, but SpaceX is listing one more for 2013 on its launch manifest. Laser communication hit headlines earlier this fall when the NASA Lunar Atmosphere and Dust Environment Explorer (LADEE) sent a packet of information by laser from the moon, breaking records in terms of download rate (622 megabits per second). Imagine yourself as an astronaut performing scientific experiments and crowd-stunning aerobatics. Suddenly, ear-stinging, blaring alarms go off. Mission Control radios that all space station personnel should evacuate to the rescue vehicles because a piece of deadly space debris is headed your way. This scenario isn’t science fiction. In June of 2011, Universe Today reported that “six crew members on board the International Space Station were told to take shelter in…two Russian Soyuz spacecraft.” As more satellites reach the end of their operational lives, there will be more space junk emergencies in space and on the ground, undoubtedly with less pleasant results. Our young space faring society has been lucky so far: the ISS has been able to steer clear of space junk, and falling, uncontrolled satellites have thankfully fallen into the oceans. But one day our luck will run out. There is hope, however. A new paper titled Removing Orbital Debris with Lasers published on arXiv proposes using a high-power pulsed laser system from Earth to create plasma jets on pieces of space debris, slowing them slightly, causing them to re-enter and burn up in the atmosphere or fall into the ocean. Claude Phipps and his team from a high-tech company named Photonic Associates outlined their method, called Laser Orbital Debris Removal (LODR) which uses 15-year-old laser technology which is now readily available. The team recognized that “thirty five years of poor housekeeping in space have created several hundred thousand pieces of space debris larger than one cm in the …low Earth orbit (LEO) band.” These may not seem like large objects, but with the energy density of dynamite, even a large paint chip can cause major damage. Removing debris is an urgent task because the amount of debris currently in space poses “runaway collisional cascading,” with objects colliding with each other, creating even more pieces of debris. There are other solutions besides creating a plasma jet, but they tend to be both less effective and more expensive. A laser could be used to grind down an object into dust, but this would create an uncontrollable molten spray, making the problem worse. Grappling the object or attaching a de-orbiting kit can both be effective. Unfortunately, they require a lot of fuel due to the need to accelerate to catch the object, which leads to more a more costly solution – about $27 million per object. Finally, there is the nuclear option of releasing a gas, mist, or aerogel to slow down objects, but this would affect both operational and non-operational spacecraft. In their paper, Phipps and his team say that removing space junk by creating a jet of plasma of a few seconds in length with a laser is the best solution, costing only $1 million per big object removed and a few thousand for small objects. Furthermore, smaller objects can be de-orbited in merely one orbit, and a constellation of “167 different objects can be addressed (hit with a laser) in one day, giving 4.9 years to re-enter” the atmosphere. All 167 objects must carefully be tracked as to not change their paths of doom for the worse; however, it is possible to use the system to adjust orbits of space junk. That being said, current levels of space debris tracking are not adequate to implement LODR, but there is a dual benefit of easier removal and better avoidance with improve debris tracking. Better tracking will then allow for better control of the re-entry point and orbit modification with LODR, if necessary. How can a light-push from a laser modify an orbit? While the laser doesn’t blast the debris out of the air, it is still effective because of the nature of orbital mechanics. Imagine a cubesat that needs to be disposed of in a low altitude, perfectly circular orbit. The tap from a high powered laser and the plasma jet generated would push the cubesat out, farther away from Earth (higher in altitude) and into a more elliptical orbit. This might seem like a horrible idea during the time the cubesat spends at a higher altitude, but as it comes half circle, it clips the atmosphere at a lower altitude since the ellipse is warped due adjustments by the laser. Since a low altitude corresponds to more drag, the cubesat slows down and locks into a lower orbit. This is why highly elliptical orbits are called transfer orbits, as they change lanes on the highway of space. Now, with the transfer orbit complete, the cubesat is slowed enough so that its orbit can no longer be achieved by the cubesat. The cubesat then falls out of the sky. The meat of the research for LODR deals with the atmosphere as the laser can become unfocused if the atmospheric turbulence is not addressed. LODR is complicated because the turbulence in the atmosphere causes distortions like those you see above a road on a hot summer’s day or like those you see when looking through a glass bottle. This complication is in addition to the aiming ahead needed to hit a target, just like the aiming ahead needed to hit a running player in dodgeball. There are two ways to cancel turbulence. First, one can shine a laser at a known spot in the atmosphere, exciting the sodium atoms at that location. Knowing the height of this dot in the sky, the system can then flex the reflecting mirror to bring the dot into focus moment-by-moment. It can then fire freely. A second way involves the use of a Phase Conjugate (PC) mirror, otherwise known as a retroflector, which could automatically undo turbulence by sending light who’s phase variation has been reversed. That is to say it will send back an “oppositely distorted” laser beam whose distortion is un-done by the atmosphere creating a sharp laser beam. There are still unaddressed problems, as Kessler points out, hitting the wrong part of a space object would have disastrous results. “You might hit the wrong part of a satellite or could vaporize enough to cause it to explode.” In spite of that, careful study of the object could avoid any danger.